It makes no difference whether you are a woodworker, chainsaw artist, or just someone that needs to cut a few trees down in their backyard. To get each job done safely and successfully, it’s important that you have the right tools at your disposal. In this case, it’s vital that you have the best chainsaw for your needs. Our chainsaw buying guide will arm you with all the information you need to make an informed buying decision. It’s possible to buy chainsaws that tackle other materials other than wood. For example, if you use one that has diamond teeth, it can cut through things like concrete, stone, and bricks! You are no doubt reading this guide today because you are thinking of buying a chainsaw or polesaw. But, you probably aren’t too sure what you need or the features to look out for. To some folks, purchasing a chainsaw can be a somewhat confusing and frustrating experience, especially if they aren’t fully informed about what they are buying. As you may have gathered from your research so far, there is a wealth of information online relating to chainsaws and the options available for them. But, how can you sift through all this detail and narrow your choices down to products that are a good fit for your requirements? The good news is that you’ve come to the right place! This complete chainsaw buying guide will discuss, in detail, everything you need to know about selecting the right product for your needs. The goal of this article is to make your life easier and ensure you make a well-informed buying decision. Before we start talking about chainsaws and their features, the first thing you need to do is think about why you need a chainsaw and where you will be using it! After all; there’s no point discussing chainsaws if you need a different tool like an alligator saw or even a simple hand saw! If you only need to do a few simple cuts in your backyard, it makes sense to direct your attention to products that offer essential features only. The last thing you want to do is buy a fully-featured chainsaw at the premium end of the market if you don’t use most of its features. The chainsaws that you can buy today are in two general categories: electric and gas. As you can probably tell, the electric chainsaws are suitable for domestic use and are perfect for homeowners, especially those with small outdoor spaces. If you have acres of land to maintain, an electric chainsaw is impractical. To overcome that problem, it’s recommended to look for one that has a gas engine. The advantage of gas chainsaws is they are portable and so can be used anywhere without the need for electricity. Of course, the only downside is that you need to put gas in it like you would your car to make it work. Still, if getting access to gas isn’t an issue, you won’t have any problems there. Home maintenance or professional use? Let’s say that you are a homeowner and you’ll only need to do some occasional cutting of branches for firewood. Perhaps you may have a small tree or two that you need to trim or cut down completely. In such scenarios, you may find that an electric chainsaw will suit your needs. But, what if you are a professional and you need a reliable tool for cutting down medium to large-sized trees for your customers on a regular basis? In that case, you need a gas chainsaw with a 45cc or bigger motor. As you can appreciate, there are chainsaws on the market that suit a variety of applications. With that in mind, it’s crucial that you determine which model or type of chainsaw is ideal for your individual requirements. How frequently will you be using your chainsaw? Just like with any products that you can buy, some chainsaws are only suitable for occasional use. Others can be utilized on a daily basis without breaking a sweat. If you only plan on using a chainsaw for chopping up firewood a few times a year, it makes sense to opt for an electric model. For a start, the cost of buying one will be cheaper than the gas engine equivalent. Another advantage is that you have to perform little to no maintenance on it. On the other hand, if you plan on using your chainsaw each day for several hours, a gas model is more suited to your needs. While it offers unlimited portability, the only downside is that you’ll need to maintain it regularly for optimum efficiency and safety. However, maintenance tasks on gas chainsaws don’t take as long as you might think, especially if you already know how to maintain them. What purposes will be using the chainsaw for? As you may have gathered from the beginning of this page, people use chainsaws for all kinds of reasons. Sure, their primary goal is to aid in the quick and safe cutting of trees and branches. But, they are also used for artistic purposes, such as carving wood or ice sculptures! There are a plethora of chainsaws on the market aimed at light use through to medium and heavy-duty work. They come in a range of power choices and accessories designed to help users complete specific jobs. It’s important to research models that are best suited to your typical applications. Not only will this save you money, but you’ll also find it easier to accomplish your tasks with the right chainsaw at your disposal. What type of wood are you planning on cutting? If you’re going to be doing some ice sculpting, you can probably skip this section! But, if your primary reason for getting a chainsaw is to cut some wood, the model you choose can make the difference between an easy job and a task that could potentially destroy your machine! As you know, there are many different types of woods out there, and some are easier to cut through than others. If you’re planning to cut through hardwoods like hickory, birch, beech, or oak, you should focus your attention on gas chainsaws. Whether you’re planning on cutting through seasoned or unseasoned wood will also have a bearing. Handle location: top or rear? Have you noticed how some chainsaws have the handle at the top of the unit, while others are at the rear? It’s important that you take into account what you will be mostly cutting with your chainsaw before selecting a top or rear-handled model. Rear-handled chainsaws are ideal for cutting anything at ground level. They are the most typical form of chainsaws that you can get on the market and are popular with homeowners and DIYers that need to carry out light-duty cutting. 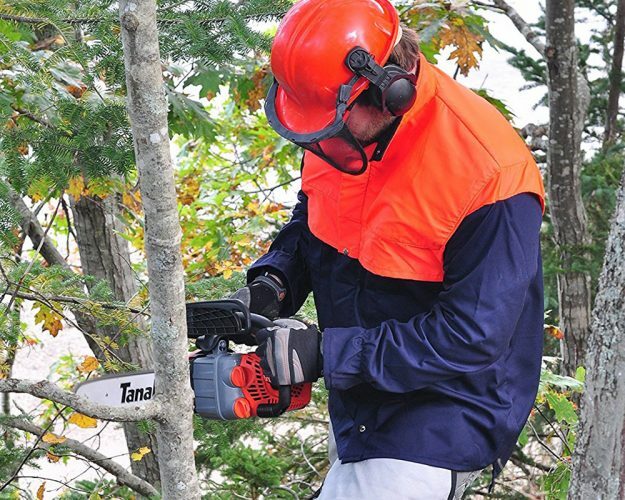 Top-handled chainsaws are mostly used on trees, especially if you are cutting them from an elevated work platform or you’ve climbed up a tree with a harness. They are models that only get used by professional arborists or those with suitable experience. They aren’t suited for beginners or people that wish to cut things at ground level. Top-handled chainsaws are for professionals cutting above ground level. So far, you know that there are electric and gas chainsaws available to buy, and you can get them with either top or rear handles. You also know which types are suited to particular environments and tasks. But, what you probably don’t know is what to look out for when considering a chainsaw. In case you didn’t know, the guide bar length gets measured from the end of the chain to where it goes into the chainsaw’s housing. It’s a measurement that represents the total cutting area and, in effect, the size of the object you can cut with a single pass. Size matters when selecting a new chainsaw. For example, let’s say that you want to cut down some trees with ease. A chainsaw with a guide bar length of 20 inches, for instance, can almost cut through double its length in a single pass. We say “almost” because the guide bar should be a couple of inches longer than the object you wish to cut. 22-inch to 36-inch: heavy duty cutting, log bucking. You can buy electric or gas-powered chainsaws, but which one should YOU choose? For domestic residential use, it makes sense to buy an electric chainsaw. These days, it’s also possible to buy battery-powered ones for extra portability. The higher the amp rating (or volts for battery models), the more powerful they are. Gas-engined chainsaws, as the name suggests, have gas motors on them measured in CCs (cubic centimeters). For home users, gas chainsaws up to 46cc are suitable. Anything with a bigger displacement will make the unit heavier to handle and is only recommended for professionals. Brands such as Echo have ranges that target occasional users to full time professionals. Log bucking, medium to heavy duty firewood cutting: large electric/35-50cc gas chainsaw. As you can imagine, chainsaws are dangerous tools. In the wrong hands, they can even prove fatal! With that in mind, it’s vital that you choose a chainsaw that is most suited to your skill level. What some people don’t realize is that chainsaws have kickback. In a nutshell, kickback is where the tip of the guide bar hits another object or gets “pinched” by the wood on either side. A chainsaw with a long guide bar will cause more kickback than one with a shorter bar. 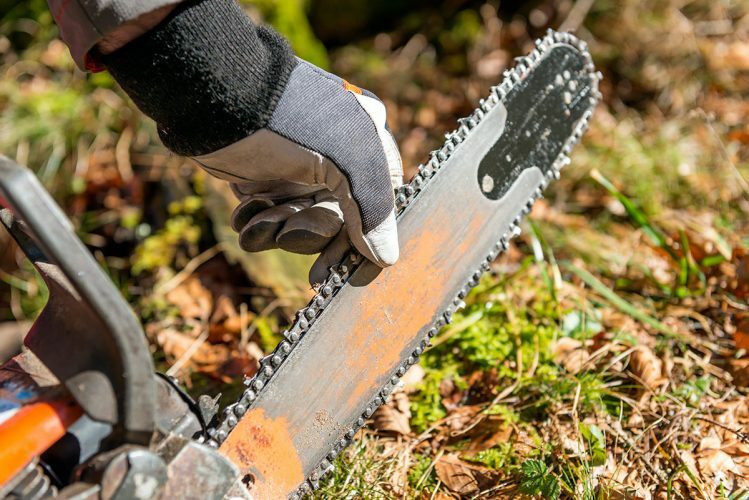 The number of people suffering from chainsaw injuries runs into six figures each year. There’s no denying that chainsaws can be dangerous machines to operate , even for professionals. Aside from the things you must buy with your chainsaw, what safety features should you be looking for that are included with the actual product? Some models, in particular, electric ones, come with tip protectors to minimize the risk of kickback. The chainsaw you buy should also have a chain brake to stop chain movement when required. Also look out for models that have chain catchers to prevent the chain hitting you if it breaks or becomes derailed. Other useful safety features include an on/off switch, safety throttle, and anti-vibration system. You can find more chainsaw safety advice here. Last, but not least, you need to be physically strong to hold and operate a chainsaw. If you aren’t strong enough to use a chainsaw or deal with kickback issues, you could potentially injure yourself. Especially if you drop the machine mid-use! If you’re planning to buy a gas-engined chainsaw, it’s essential that you perform routine maintenance on it. But, what do you need to do to keep your gas chainsaw operational and efficient? Well, as with a car, you need to give it gas as that’s what fuels the engine. And, just like with any vehicle, the engine also uses oil for lubrication of internal parts. You can use regular gas with your chainsaw in most cases, and two-stroke engine oil for lubrication. You should be aware that there are two types of oil that your chainsaw uses. The first is bar and chain oil, and, as the name suggests, lubricates those items. The second is engine oil and is mixed with gas to lubricate the motor. It’s important that you follow the chainsaw manual’s instructions regarding oil types and oil/gas mixture ratios. At some point your chain will either need replacing or sharpening. A dull chain will make heavy work of cutting and can be a danger to the user. Ensure you select a chainsaw where own brand spare chains are available or that brands like Oregon, Stihl and Rotatech supply replacement chains for. When you do replace be sure to fit the chain in the correct direction. When selecting a gas chainsaw, also find out how easy it is to access the spark plug and air filter. That’s because they are two parts that will occasionally need replacing, just like they do in a vehicle. Hopefully, this chainsaw buying guide has given you some insight into chainsaws and an idea of the type you should select for your own needs. Feel free to browse our latest chainsaw reviews.